Samsung is not going to take all this hype about the Motorola Q smartphone lying down, because now that the FCC approved its so-called "Q killer," the Samsung SGH-i320 is ready for battle. Except for being black rather than the Q's brushed aluminum with black trim, the i320 appears to go head-to-head with the Q, especially when you look at its 11.5mm thickness, a spec that exactly matches that of its Moto rival. 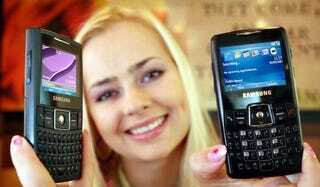 It has a 2.2 inch LCD, 1.3-megapixel camera and a microSD slot, and just like the Motorola Q, runs Windows Mobile 5.0. Let the battle begin.